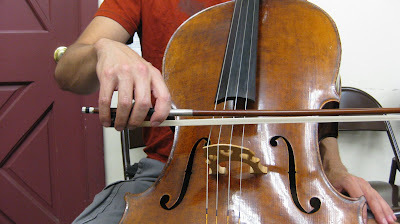 Well, no matter what crazy antics I’m up to , there’s always room for Cello. Since I’m not sure if this is going to make it into my book, I thought it might be cool to post some pics here. All of the pictures here exemplify at least 80% of what I ask for in a bow grip. You’ll notice one has their pinky behind the stick, a position I call “Pinky Probation”. I have them place it there because of tension, and especially the kickstand tendency. 1) Most importantly, a single gesture. A hand that is draped as opposed to a series of maneuvers performed by individual fingers. 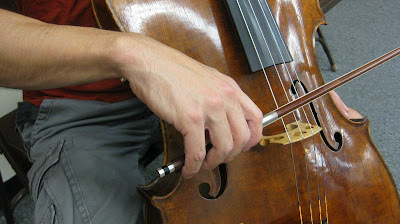 The bow hand is much, much more than the sum of its parts. 2) A “flat” wrist. Looks different that you thought, eh? At the frog, the wrist does bend upwards a little bit (as if it’s been lassoed and is hanging there). 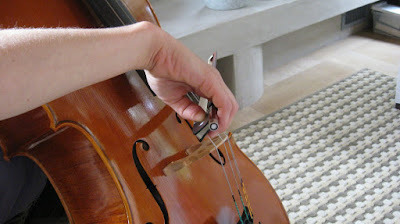 It does this as a function of its flexibility (not floppiness) and also because at the frog, particularly on the A, you need to avoid banging into the side of the cello! 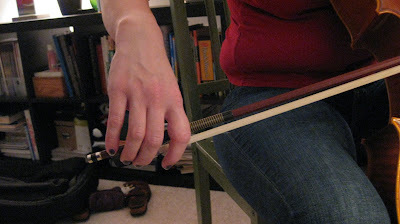 The wrist flattens more truly in the middle to the tip of the bow. Keep in mind also that if the top of the arm/wrist is flat, then there will be a little curve on the underside, because we’re built like that. 3) A slightly curved thumb. Some of these students are really bending, and that’s corrective action. I’d rather have a huge bend than a jammed, straightened, hyperextended thumb. To tell the truth, my thumb is constantly moving to accommodate my hand’s comfort. Not a lot, but it is. Think of it like the springs on your car: they’re continually moving with the road. Unless, of course, you’re like one of the people who calls Click and Clack, and have not maintained the car. Then the bow/spring analogy kind of implodes upon itself. 4) A practically useless pinky. 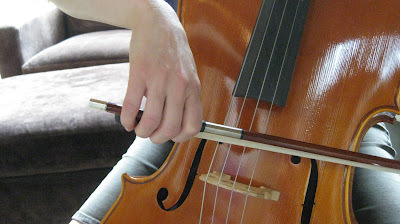 Yes, there are exceptions, but if you’re doing a revamp and have had pinky tension issues, don’t practice with an exception in mind. PreviousLas Cruces to LA, via "The Thing"
Boy, do those people look uncomfortable! 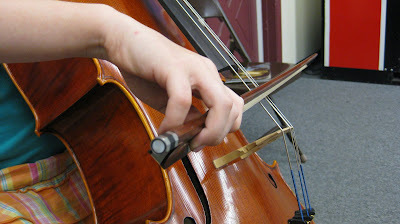 My 6 year old is learning a little cello this week. The teacher has a really cool bow trick and it seems to have her end up with something that looks right, but I could never explain it to a student myself. Which is just one more reason, I could never teach! Let's see your bow grip, then. I do the "Pinky Probation" thing now and again when I feel my pinky working too hard. My bow grip has come so far in the past ten months that I wonder how I managed to play with my twisted, angled grip before. I just said the "look" uncomfortable. I'm not a teacher, so I don't look at other people playing very much. I guess I never thought about my bow grip much, so i never thought about anyone's bow grip much before I wanted to show my kid how to do it. I had a lot of teachers who had a lot of comments, but never said much about how I held my bow. S: You should definitely look at other people's playing a lot! As a teacher, I consider myself just a really advanced student. I need to maintain a curiosity about technique and function so that I can bring those things competently to my pupils. Those hands look like comfort to me, with maybe one exception. Perhaps if you imagine the weight of the arm falling onto the fingers, it will help, too. I chose those pictures specifically because they are the ones who are successfully implementing the right kind of approach to the grip. Youtube is great for this..
As a student, I consider myself a not-so-advanced observer, but these bow holds look pretty good to me. To my relatively untrained eye, one appears to be a little bit too spread out, and one pinky might be a bit collapsed, but not terribly. And a few look very comfortable, indeed, compared to others I've seen. I think it helped me a lot when I understood that the pinky does indeed have some important uses! 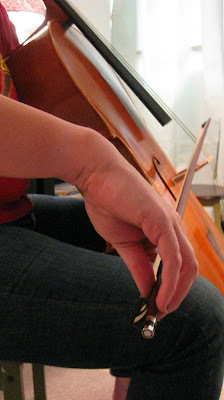 Like holding the bow when not actually playing, or air bowing, or during pizzicato. The problem then is just to remember to turn off that pinky tension when it's no longer needed. More comment, that I forgot: The term "flat wrist", then looking at these pictures, just doesn't do it for me. I can see "not floppy", but flat? Might the Car Talk guys say it has to bend very easily, but just the right amount, no more, no less, just like the linkage to a standard transmission? If the linkage sticks at some point, not good. If the linkage flops around at some point, also not good. (I know what it's like to have a transmission linkage that sticks or flops around!!) I hope your road trip doesn't have any of that! I struggled for a while with my bow hold. My first teacher said my wrist wasn't flat enough (but characteristically didn't tell me how to fix it). 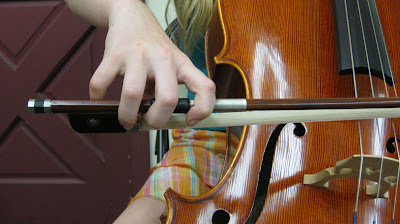 Then I discovered turning the bow at an angle so you are playing more on the playing edge of the hair. 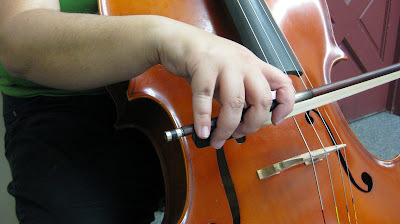 Now I am concentrating on getting more force *when needed* on the first finger and less on the thumb, where I think a lot of tension can creep in. FWIW my present teacher thinks my bow hold is pretty good. 1) bought a Richard Grunke bow (octagonal, just shy of standard weight) – lovely! 2) joined an orchestra – 1st rehearsal last night. Best fun I've had sitting down! Thanks for this, especially the pics. I really can't wait for your book . . .
Any chance you might do lesson podcasts in the future? An instructional video? Ditto what annecychic said! Short video "helpful techniques" would be amazing. I'm still having minor pinky issues. If I haven't played in a while or when I play a lot, my pinky starts to get sore which makes me think that I'm still doing work with it when I shouldn't. When I was in Italy, teacher there gave me the advice of finding the right balance of how far the fingers on top should be spread. If the balance is right, there shouldn't be a need for the pinky to work. A story I just read, don't know that it's true — Piatigorsky once broke his right thumb shortly before a concert in which he was to perform the Dvorak concerto. No time for a trip to the hospital; he just played the concert holding the bow in a fist, ie, no thumb. No one noticed and the performance was highly praised. Somehow I find that not terribly surprising (although legends like these do tend to get exaggerated). Seems to me if the back and arm work right, the hand is no big deal. 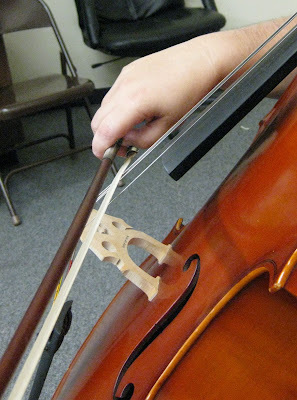 Follow up to my first comment and your responses: My daugher is six and started playing the cello a couple of weeks ago. She is apparently taking your advice and watching bow grips herself. This weekend she announced that I was holding my bow wrong!!!! I too must watch more and learn!